Product #22125 | SKU SR64UXA/TQN | 0.0 (no ratings yet) Thanks for your rating! 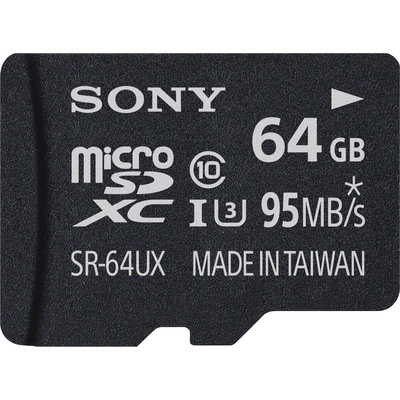 The Class 10, U3, 64GB High Speed microSDXC UHS-I Memory Card from Sony is designed to be used in a variety of devices including smartphones, tablets, cameras, and PCs. With enhanced data read speeds of up to 95 MB/s and write speeds of up to 50 MB/s, you can capture fast-motion photos and videos, then transfer that data to your PC via the included SD adapter. In addition to simply transferring the data, you can also utilise the downloadable File Rescue software to attempt to recover photos and videos that have been accidentally damaged or deleted. You can also take this memory card with you virtually anywhere you go because it's water proof, dust proof, temperature proof, UV resistant, and static resistant.